Caption slip reads: "Photographer: Snow. Date: 1955-07-12. Reporter: T.T. Assignment: Camp Fire Girl Award. 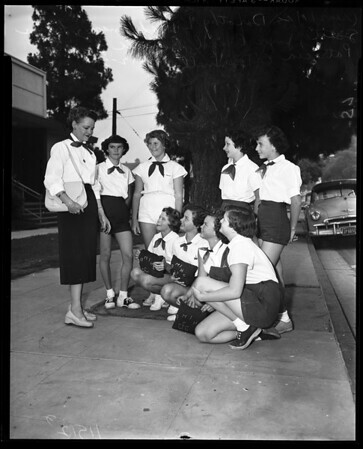 45-46: Mrs. Dorothy L. Haldeman, 37, of Downey, who has received National Leadership Medallion of Camp Fire Girls. 7-8: L to R - (rear) Mrs. Dorothy L. Halderman, Linda Scott, 12, Joyce Brazel, 12, Bonnie Levin, 12, & Patricia O'Donnell. L to R (seated front) - Penny Haldeman, 13, daughter of Leader Award winner, Judy O'Sullivan, 13, Mickey Ostrander , 12, & Joan Troesch, 12.